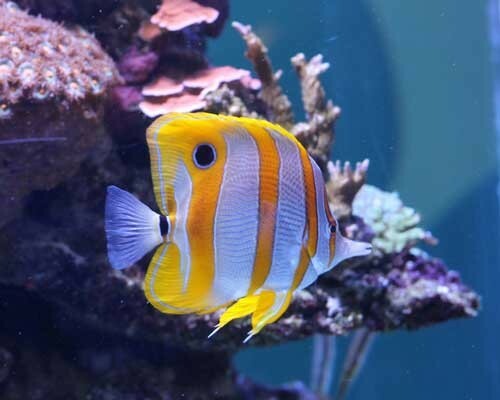 The Copperband butterfly is a beautiful and iconic saltwater aquarium fish species. The long nose, honed by evolution for picking meals from tiny crevices in the live rock. The alternating black-lined goldfish yellow copper-colored bands and white coloration pattern. The false eyespot on the rear part of the dorsal fin and the relatively tall, slender build of the fish give it a graceful, pleasing appearance. Fully grown, these fish can reach about 8 inches in length. They should only be kept in a relatively larger aquarium–75 gallons or larger. Some websites recommend 125 gallons or more. If you want to impress your friends at the next trivia night, the Latin, or scientific name for this copperband butterfly is Chelmon rostratus. If this does impress your friends, send me an email. I think I’d probably enjoy hanging out with you and your friends. The copperband butterfly is native to the coral reefs or rocky shores in the Western Pacific Ocean–Indonesia, the Philippines, etc. It’s not likely that this fish will spawn in captivity, but in the wild, they do form monogamous pairs, when breeding. 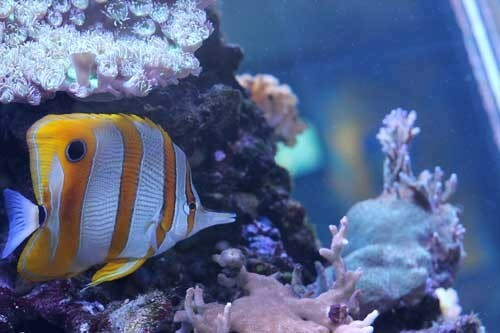 Like most fish in the saltwater aquarium hobby, there are reports of aggression between two copperband butterflyfish, so it is strongly recommended that you just keep one per aquarium. Reef safe? Well that depends on the tastes for the individual Copperband butterfly you get. 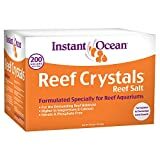 If you have any concern at all if the fish was to nip at your prized corals, I would advise strongly against adding this saltwater fish to your tank. The copperband butterfly likes to graze the live rock and sand in your tank, looking for worms and other fun things to eat. 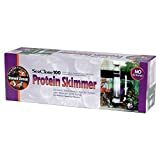 You can also feed them brine shrimp, blood worms, black worms, mysid shrimp and very small pieces of clam. These fish can be shy–so if you have boisterous, aggressive tangs or other fish that will compete aggressively for food, you should target feed the copperband butterfly to ensure they receive adequate nutrition. Because the copperband butterflyfish can be a shy and finicky eater, they are best reserved for moderate-to-advanced hobbyists. 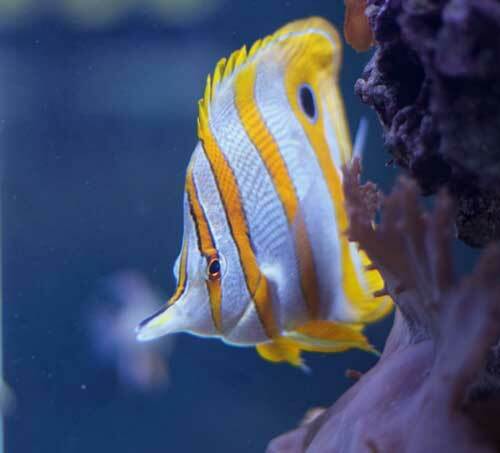 Since we know the copperband butterflyfish is a picky eater, in the home aquarium, one of the most important things you can do, when selecting a healthy fish, is to ask your local fish store to feed the fish in front of you, so that you can watch to make sure it will take traditional aquarium foods. While this species is characterized by a thin (laterally compressed is the other term to impress those fishy friends of yours that we talked about earlier) body type, you want to look carefully to assess that you’re not picking an unhealthily skinny individual. Look carefully at the dorsal (upper back) muscle right behind the head. If the ‘meat’ of the fish sinks in there and you can see the spine, that is a sign of starvation, in any fish, but of course knowing this is a picky eater…that’s a pretty big deal. You should point this out to the local fish store manager so they can provide some hands on care–and be sure not to buy that fish. You should also look for and avoid fish with any signs of significant damage–bruises, frayed fins, and parasites like ich. One of the most common reasons to add a copperband butterfly to your saltwater aquarium is to help control an exploding population of aiptasia anemones. The copperband butterfly likes to eat meat invertebrates like tube worms, clams and mollusks–and they will also eat aiptasia, although there are mixed reports about how eager they are or are not to eat this invasive pest.